The prior European edition of the Sustainable Cosmetics Summit took place at the Paris Marriott Champs-Élysées hotel on 5-7th November 2018. The Sustainable Beauty Awards was hosted alongside the summit at the same venue. 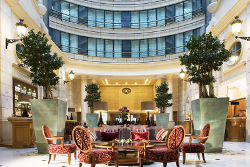 The hotel is conveniently located in the heart of Paris, on the world famous Avenue des Champs-Élysées. It is within easy walking distance to major landmarks, such as the Eiffel Tower, Arc de Triomphe and the Louvre. Overlooking the the world famous Avenue des Champs-Élysées, the hotel is easily accessible by car, rail and other public transport.